Home > Dangerous Bacteria > Which Bacterium Causes the Plague? Plague, also called the Black Death, caused great pandemics that spread over the world in medieval times causing millions of deaths. The causal agent of plague is the bacterium Yersinia pestis. The first world plague happened in the 1340s, starting in the Middle East and spreading west into Europe. In total, around 75 million people were killed, which was about a quarter of the world’s population at the time. Europe was very badly affected and mortality is estimated by some experts to have reached 60 per cent of the population. Each time a plague epidemic receded, it was replaced a few years later by another one. In total more than one hundred plague pandemics occurred between the 1300s and the 1800s. The Great Plague of London hit in 1665 and lasted into 1666, the year of the Great Fire of London. 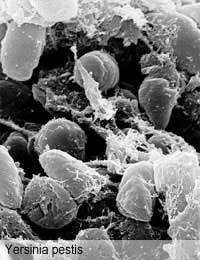 Yersinia pestis is a rod shaped bacterium that can live and divide well in aerobic and anaerobic conditions. It was discovered by Alexandre Yersin, a Swiss bacteriologist working at the Pasteur Institute in Paris. The bacterium is carried by fleas that infest animal hosts, usually rodents. The fleas introduce live bacteria into the bloodstream of the rodents and bacteria pass from the rodents to the fleas by the same route, creating a reservoir for Yersinia pestis. When infected fleas bite humans, the bacteria are passed on in large enough numbers to cause infection, although the fleas themselves may not live on the human host. Human plague can take three different forms. Pneumonic plague occurs when Yersinia pestis infects the lungs, causing severe pneumonia. This produces the typical symptoms of coughing, fever, chest pain and prostration. However, the bacterium is extremely destructive and the delicate alveoli in the lungs rupture, causing extensive bleeding, which is usually fatal. Pneumonic plague is transmitted from one person to another by coughing and sneezing and is fatal in about half of all cases, even if treatment with antibiotics is available. Without treatment, virtually all people who catch pneumonic plague die, which explains the high death rates seen in medieval times. Bubonic plague occurs when the bacteria invade lymph nodes in the body and divide actively within them, causing huge swellings, or buboes. These are most common in the armpit, neck and groin. Prostration and fever are also typical symptoms. Although not as deadly as pneumonic plague, survival still depends on prompt antibiotic therapy. Without treatment, the bacteria can spread through the body causing septic shock and death. The final type of plague is really an extension of the other two types. Septicaemic plague occurs when the plague bacteria spread from the lungs or lymph nodes into the bloodstream and rampage through the body, causing damage to all the important organs. This form of plague is also fatal in most cases. Although the worldwide pandemics of plague ceased after the 1800s, plague outbreaks do still occur. These are usually seen in poor, overcrowded areas in sub-Saharan Africa, where contact with rodents bearing infected fleas is more common. A plague outbreak killed over 60 miners in the Republic of Congo in 2005, creating widespread panic in the country, but it was contained fairly quickly. Some epidemiologists, experts in how diseases spread, predict that plague could become a much bigger problem in the future as climate change, caused by global warming, will probably increase rodent populations. This will extend the animal reservoir for Yersinia pestis, making it more likely that infected fleas will bite humans. Plague has quite a few similarities to anthrax – it takes three forms and it causes a very high death rate, it kills quickly and it spreads easily from person to person. It is inevitable, therefore, that Yersinia pestis is also considered a serious threat as a potential bioweapon. Spreading aerosols containing the bacteria to set up infection in a highly populated area would be extremely difficult for even the most organised industrialised country to cope with. Hospital and health care systems would become overwhelmed very quickly, and it would be a huge logistical challenge to treat people who had not yet become infected with antibiotics to prevent them contracting plague.